100% natural, flawless coverage in a tube! Introducing HD Cream foundation with Ceramic Microspheres for a flawless airbrushed finish. Lightweight 100% natural formula won't crease or settle into fine lines. Natural matte finish that blends beautifully, and looks like healthy skin. Sets to a dry finish so you won't leave grease marks on your clothes or phone. Shade selection: Grab a few samples. The light shades are REALLY light. To determine if you have just the right shade apply to your skin, and let it sit for a few minutes. The color changes a little bit as it warms up, and then stays the same all day. Cool is a great for people with pink/red undertones ...it's a match to the Ebony in the powder foundations. Application: Warm the package gently in your hands for a few seconds, and then apply directly to your skin. Blend with your fingers, a damp sponge, or a flat-top brush. Set it with your favorite finishing powder. I am on my 2nd tube of this. C20 matches my fair skin very well. If you have dry skin it needs to be well prepped for best results. It look a little tweaking to find the best way to apply. I find the warmth of my fingers works best. This foundation is sooo good!!! I used to use the 100% Pure foundation which I loved, but I didn't love the price. I've been loving this cream foundation I think more than the 100% Pure one! My skin is pretty dry in the winter but it gets a bit oily in the summer and this foundation has been amazing for however my skin is! My skin is also pretty acne prone and I haven't had any issues with breakouts since I started using this foundation! I love how many shades there are and the sample sizes. I always have issues finding a good shade but with this foundation, I've found my perfect shade! I also bought a dark shade so I can mix it with my light shade when I'm tan. I apply it with my fingers. I've found that works the best. It has such amazing coverage too and it's super buildable! I love this stuff and I'll never stop using it! The last natural foundation I had been buying had been discontinued. I tried what the store offered as a replacement and it looked pasty, grey, sickly and clownish. Plus it had additives. Nightmare. With dry skin, I needed a cream foundation and now I was fresh out of options. I have used Silk Naturals powders for years but I was unaware they also made cream foundation. As a lark, I did a search and was so excited to find the HD Cream Foundation. I tried several shades of sample sizes. Now I only regret not having found them sooner. They go on smoothly, look natural and all of the shades were flattering! Toughest part is picking which color for my full size order. This is all I am using from now on. Plus, the samples are perfect for travel. Thank you for making these Karen! I ordered a sample of this product expecting to have trouble with the color bc I always have trouble finding a color that is just right. 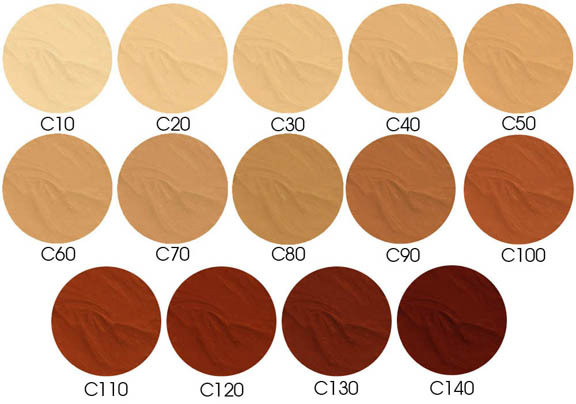 I was pleasantly surprised that the C20 was a great match for my skin tone. I have light skin but not the porcelain white color and I have redness of my cheeks. I think my skin color would be a fair medium color. The C20 looks great. im looking forward to purchasing the full size product when I can afford it. I'm disabled so I can't afford much now and I was sent a full size blush along with my order as a gift. I really appreciate the kindness of Silk Naturals and now I have a beautiful blush to wear along with my foundation sample. Of course, I don't always have the time or energy or want to do a full face of makeup, so I would like a shade that doesn't make my face glow ghostly white by itself. :P I am waiting for my sample to try the C20 to see if it matches better as full coverage on a regular day. This is the loveliest foundation I've ever used. I'm currently working with samples (great way to find the right shade! Yay!) I apply this with a damp, flocked cosmetic sponge or my fingers. It gives my skin a flawless, soft matte finish. My pores are covered well (doesn't sink into them,) and it leaves my skin with such a soft, even texture. Doesn't settle into my lines and wrinkles when applied over moisturizer. My skin feels creamy and smooth. After a few minutes, it does change colors subtly and becomes perfect. Wears well 8 hrs.+ Try it, you'll like it!